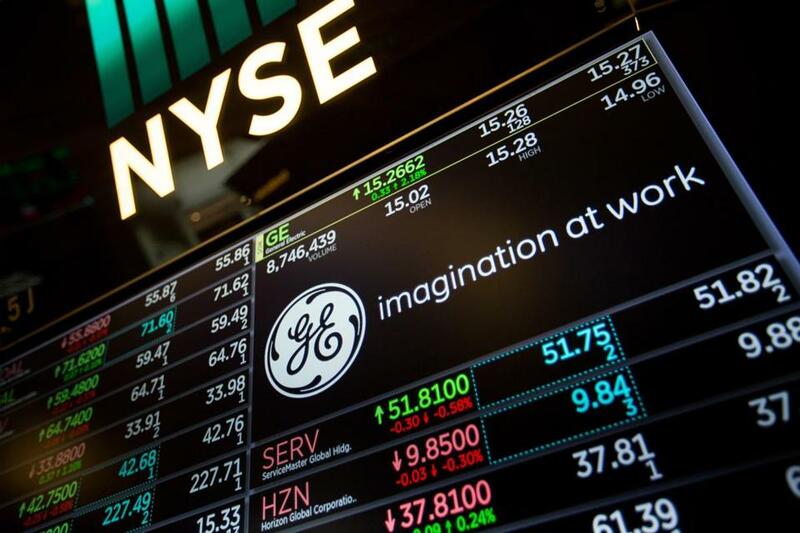 GE advertising at the New York Stock Exchange in March. General Electric Co. shareholders who thought the worst was behind them when Larry Culp took over as CEO last month got a nasty surprise Friday when the shares plunged below $9 for the first time since the financial crisis in 2009. The drop came after JP Morgan analyst Stephen Tusa lowered his price target for Boston-based GE to $6, according to CNBC. Tusa painted a bleak picture of the company’s future, saying that six of the shrinking conglomerate’s eight divisions for which financials are broken out will be unprofitable by 2020, CNBC said. GE responded with a statement that it is “fundamentally a strong company with a sound liquidity position.” In other words: It has plenty of money to work with as it cuts debt, sells at least $20 billion in assets, and focuses on its jet engine, power turbine, and renewable energy businesses. The shares closed at $8.58, down 5.6 percent, after dropping to as low as $8.15. That’s a decline of 29 percent since Culp was appointed Oct. 1 to replace John Flannery, who was forced out after less than two years in the job. Larry Edelman can be reached at larry.edelman@globe.com.